In this day and age, fitness and health is a top priority that most people have begun taking very seriously. One of the more extreme activities that will keep you fit, strong, as well as allow you to relax, is kayaking. One of the first things you will need, obviously, is a kayak. There are hundreds to choose from, and trying to wade through them all to find the right one for you can be a very daunting. We’ve made a list of the best inflatable kayaks we could find. Why inflatable? Inflatable kayaks are perfect for everyone from beginner, to expert level. They are well made, handle many different situations, and can fit in the boot of your car, great for a spontaneous paddle. This list will include some brilliant budget options, kayaks for experts, as well as kayaks that you can store and take with you on a casual weekend away. 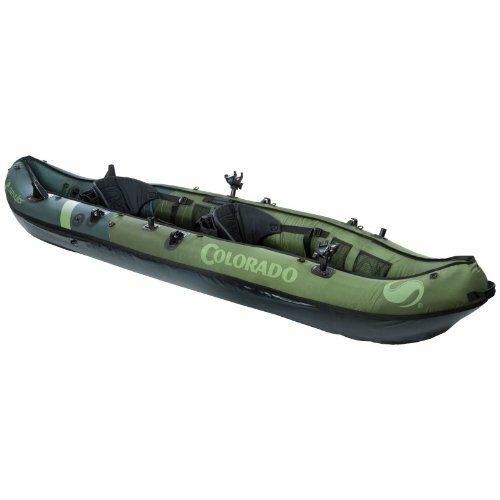 TLDR: Our Editors choice for best inflatable kayak for 2018 has to go to the Advanced Elements AdvancedFrame kayak. The built in ribs add a tremendous amount of strength and durability to the frame. The simplicity of unfolding it and inflating it with ease makes this a must have. It is most definitely on our wishlist and a kayak we all want folded in our car boots. The our pick for the best inflatable kayak is the Intex Challenger K1 Kayak, brilliantly made, strong materials, and as good, if not better, than any other hardshell option. Check out our in-depth review of the Intex Challenger K1. Our favourite 2-person kayak is the Sea Eagle inflatable with the deluxe package, comfortable and well made, the extras are sure to make this a favourite. The best 3 seater inflatable kayak we could find was the Sevylor Big Basin 3-Person Canoe, made from heavy duty PVC. It may not be able to handle itself on strong waters, but the tarpaulin bottom will help prevent punctures while you take a leisurely paddle down the river. Our favourite inflatable kayak for fishing is the Sevylor Coleman Colorado, this two person canoe/kayak has all the gear, attachments, and comfort needed for a brilliant day of fishing. The AdvancedFrame Kayak by Advanced Elements is most definitely our favourite for whitewater. Strong, sturdy, and incredibly well made, it won’t let you down. The Sea Eagle with the Pro Packageis our favourite for the ocean as the UV and saltwater resistant body will last a long time and serve you incredibly well. 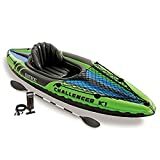 The cheapest and our pick for a kayak for under $500 is without doubt the Intex Challenger K1, extremely cheap and reliable, this kayak is ideal for family fun or a gentle paddle on the lake. Our favourite inflatable canoe goes to the Sevylor Big Basin 3-person canoe. Great for families or anyone looking to take up canoeing as a hobby, it’s well made, well priced, and very reliable. The best inflatable available on Amazon Prime is the Intex Challenger K1 Kayak. this one person kayak is the best kayak for beginners, kids, or someone wanting to try out an inflatable for the first time. The kayak is also incredibly well priced and it is very easy to replace if it is damaged beyond repair, once again, making it ideal for beginners. Now that we’ve had a quick overview of all the kayaks, we’ll now take an in-depth look into all of them. The Outdoor Tuff One-Person Inflatable Sports Kayak is an incredibly well made, rigid, strong and durable one-person blow -up kayak that, when fully inflated, is almost as sturdy as a traditional canoe. This kayak is made with three, highly durable, PVC air chambers that give the kayak immense rigidity and strength when inflated. This is an amazing feature as some inflatables aren’t as sturdy as their hardshell counterparts. This kayak is also extremely portable. When deflated, it weighs only 25 pounds and can easily fit in the backpack that comes with the set. With it being so compact, you can easily transport it in the boot of your car, on a motorbike, or even just on your back while taking a hike. The kayak comes with a high pressure valve and a foot pump. You can inflate it to its full length in minutes. Included with the set is a lightweight rotatable paddle, an inflatable seat, as well as two fins for maximum control and direction. The Advanced Elements AdvancedFrame Kayak is different to other blow-up kayaks as it comes with built in aluminium ribs that define the kayak and add extra strength and durability that some other inflatables may not have. This kayak is a great hybrid between an inflatable kayak and a folding kayak, offering the best of both to give you a compact, lightweight, yet strong kayak. Made with 3 layers of highly durable material, it is also tops any rips from spreading. The kayak has two separate air chambers that spread the air across the entire kayak to not only add a high level of stability, but also a high level of safety when you’re out on the water and it gets a bit rough. Even with the built in ribs, this kayak is still incredibly compact and can be taken out on any trip. With the extensive onboard storage, you can take along anything you may need for a day out on the water. The Intex Challenger K1 Kayak is one of the most highly reviewed and loved inflatable kayaks. With its incredibly good price, its well built design, and high quality materials, we can see why its a firm favourite. This kayak is incredibly nimble and durable will hold its own on a lake or river. Made from strong, welded materials. It also has very bright, eye catching graphics that make it easy to see in case you have an accident and need help. Safety is priority. The cockpit is designed for comfort and does that job brilliantly. It also has quite a lot of space to allow you to store essentials, as well as having a cargo net in from of you for extra storage. The floor has inflatable beams that even even more stability. This one person kayak has a maximum capacity of 220 pounds, perfect for most kayakers or beginners, and comes with a 84 inch aluminium oar, a repair patch, and a high output pump that allows you to blow it up in minutes. The Intex Explorer K2 Kayak is a two person kayak that, much like the K1 Challenger, is a favourite amongst beginner kayakers and experts. Made with the same quality materials as the Challenger, the Explorer is just as sturdy, and just as rugged. Once again, the price is a definite selling point if you’re looking to get a 2 person kayak for a casual paddle down a stream or river. You get a high quality kayak for a price that you definitely shouldn’t miss out on. The Explorer comes with a removable skeg that allows for maximum control and direction while out on the water, and being removable, adds to how compact this kayak really is. The bright yellow colour ensures safety and visibility in case of a mishap or accident. It is not advised to take this kayak on fast moving bodies of water as its rigidity is limited and you may encounter difficulties, but for calm and gentle waters and a relaxed paddle, it is ideal. The Sea Eagle Inflatable Kayak is definitely a step up from a beginner blow-up kayak. With more advanced technology and the ability to hold 3 people, as well as be used for multiple purposes, this inflatable is for the more advanced kayaker. This kayak is incredibly well built and can be used by one person, or two, and the strong material even allows you to take your dog along with you, without risking its claws puncturing the material. 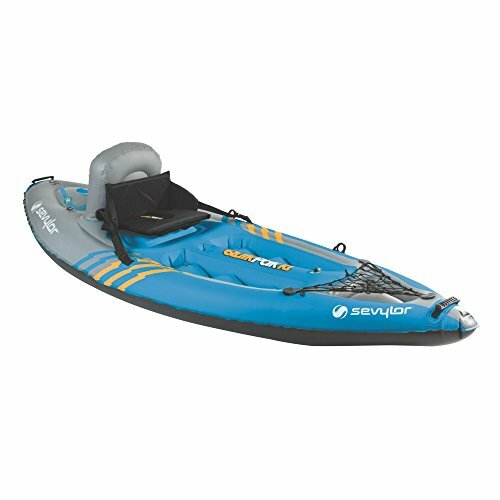 The Pro Package includes two 7’10” paddles, 2 deluxe and ultra comfortable inflatable seats, a carry bag, a foot pump, and a repair kit. It has everything you need all included in one brilliantly priced package. This kayak inflates in 8 minutes and has 2 carry handles, a self bailing drain valve, 5 deluxe one way valves, 2 skegs for more control and speed, and also has a sun and saltwater resistant hull, meaning you don’t have to worry about wear and tear, irrelevant of where you’re paddling. This is another highly rated kayak that is ideal for a single person, or a tandem paddle, in a lake, down a river, or even in the sea. Another cracking krayak from the folks at Advanced Elements, this inflatable is made with the AE precision, quality, and strength the brand is known for in the kayaking world. Sturdy, rugged, and simple, this kayak is up there with one of the best inflatables on the market. 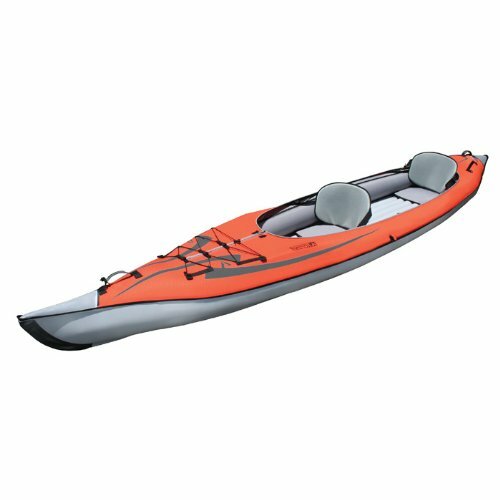 Much like the AdvancedFrame Kayak made by Advanced Elements, this kayak comes with built in aluminium ribs that add a lot of rigidity to the bow and stern, increasing overall control and strength to the kayak. The kayak is made with 3 layers of material for a very high level of puncture resistance. The kayak is pre-assembled, and to get started it is as simple as unfolding, inflating, and placing in the seats, which can be done in a matter of minutes. The seats are incredibly comfortable and come with high support, keeping you comfortable for hours on end. The seats are also adjustable, there are 3 seating locations allowing for solo use, or in a tandem. Another great kayak from Sea Eagle, this kayak that comes with the deluxe package is a brilliantly made kayak made from highly durable and strong material that can take a beating out at sea, and even withstand dog claws and paws if you’re taking your buddy out with you on the river. The kayak can fit into the carry bag provided, with extra space for camping gear or whatever other gear you may need for your trip. You can use it for fishing, out on the ocean, diving, or taking it on in whitewater on the river. The I Beam construction flooring increases rigidity and strength, the kayak also has inflatable side skirts, inflatable and removable seats, a self bailing drain valve. The skegs add control as well as speed and allows for smooth tracking no matter the water conditions. 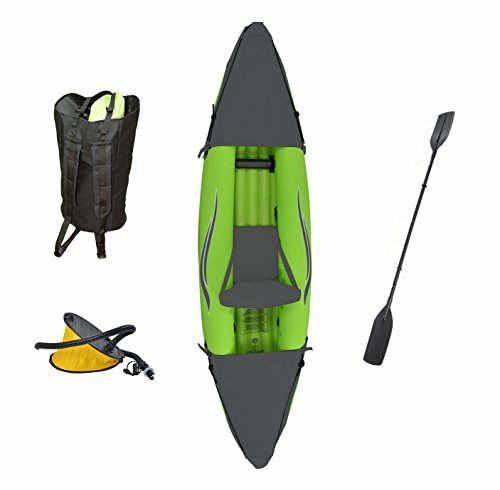 The Deluxe Package comes with the kayak, two inflatable seats, a foot pump, a pair of oars, a repair kit, a carry bag that everything fits into, as well as instructions. 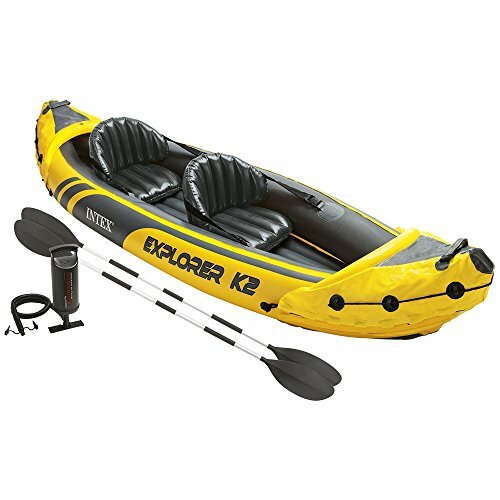 The perfect all in one inflatable kayak set. The Sevylor Quikpak K1 Kayak is one of the quickest and easier to set up kayaks on our list. The super simple design and the way you use the accessories makes this kayak incredibly compact and easy to use. The kayak has multiple air chambers which ensures the kayak stays afloat even if there’s a puncture. The kayak only takes 5 minutes to inflate, quick inflation means more time on the water. The kayak is made from 21 gauge PVC that is incredibly strong and durable. The kayak also has a tarpaulin bottom that provides protection against punctures in murky waters. The Airtight technology also prevents leaks. The set includes an oar, an air pump, as well as a carry bag that doubles as the seat, saving you space and carrying weight, making this kayak even more convenient for traveling and storage. The Advanced Elements Firefly Inflatable Kayak is a great, family friendly kayak that has all the features and durability you would find in a hardshell kayak. This super compact kayak is ideal for a lazy paddle down the river. The kayak has built in rigid panels that help that define the bow and stern and allows for smooth tracking and for the kayak to cut through the water with ease, much like a hardshell kayak. The kayak is made with highly durable material, has grip handles, bungee deck lacing, a pocket for equipment, and a tracking skeg to improve direction and control. The heavy duty PVC main chamber is built to last. This super compact and easy to use kayak is the perfect fit for a family or for an easy to transport kayak when traveling. Store it anywhere you need it and have it set up and ready to go in a matter of minutes. 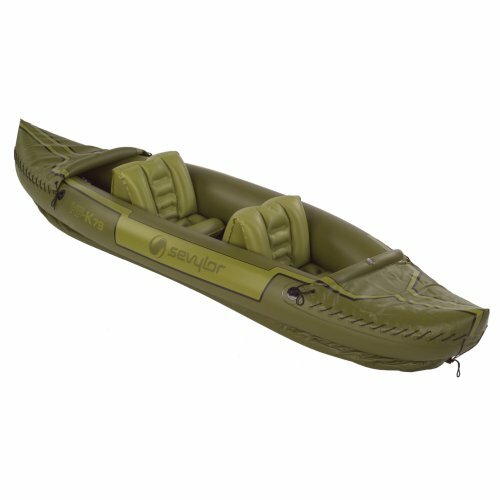 The Tahiti Fishing and Hunting Kayak by Sevylor is based on Sevylor’s very popular Classic Model that has been used worldwide since 1963, and with the camo green coloring, it is the ideal hunting and fishing kayak. 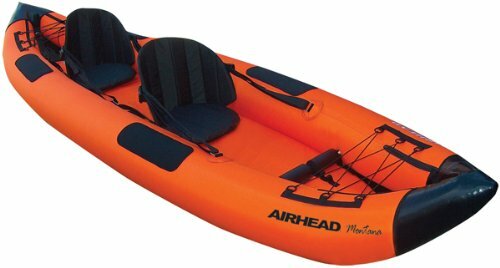 The two person kayak is made from heavy duty and durable 26 gauge PVC that is made to be tough and last a very long time. It also has two air chambers and tubular I-beam flooring for extra stability. The specially designed seats are made to be extremely comfortable and allows you to stay comfortable for extended periods of time, perfect for long days out on the water hunting that perfect trophy fish. Using Sevylor’s exclusive Airtight System, the kayak is guaranteed not to leak. The kayak also features Double-Lock Valves to prevent accidental air loss and makes inflation and deflation quick and simple. The Sevylor Coleman Colorado 2-person Fishing Canoe is made from heavy duty 18 gauge PVC, designed to be rugged and tough. The bottom of the canoe is made from 1000D tarpaulin, and the cover is made from 840D nylon. This canoe is built to withstand harsh weather and use. This blow-up canoe is made with multiple air chambers, this means that even if one chamber gets punctured, the canoe will stay afloat and you can make it back to shore. The canoe is also made with Sevylor’s Airtight system, which prevents leaks, keeping you dry all day long. This canoe comes with Berkley rod holders, which are adjustable and allow for easy hands-free fishing. The canoe is fitted with Sevylor’s trolling motor attachment, allow you to expand your fishing capabilities. The paddle holders also ensure your paddles stay out of your way. The canoe is fitted with mesh pockets to allow to store either equipment, food, or anything else you may need for a day out on the lake. There are also additional D-rings that allow you to attach any additional equipment you may have. The seats are also incredibly comfortable, great for prolonged stays on the water, they are also adjustable so you can fit them to your needs. The AHTK-2 Performance canoe by Airhead is a 2 person, ultra lightweight and compact canoe, perfect for taking on road trips or quickly putting it in your boot for a spontaneous trip to the river or lake. You never have to miss out on the perfect canoeing moment again, keep it with you or in your car all the time. This 12 foot canoe has a semi rigid, heavy gauge PVC construction, giving it strength and durability. The tubular I-beam flooring adds comfort and stability, as well as tracking. The moveable and removable seats add comfort and back support. The canoe also has two Boston valves or quick and easy inflation and deflation. The 3 air chambers are made from strong 840-denier nylon, and have been treated with UV and water resistant coatings. The bottom of the canoe is fitted with durable tri-laminate reinforcements to add stability, strength and control to the canoe. This canoe is designed for lakes and moderate rivers, great for beginners. The canoe comes with some great extras, there are padded elbow pads for comfort, it’s incredibly easy to inflate and deflate, the stainless steel and nylon hardware will not corrode, there is also a stretch net on the bow to store packs, equipment, or any other gear you may have. This 3 person blow-up canoe by Sevylor is made from heavy duty PVC, made to last and be durable out on the lake. It may not be able to handle itself on strong waters, but the tarpaulin bottom will help prevent punctures while you take a leisurely paddle down the river. Perfect for some family fun. 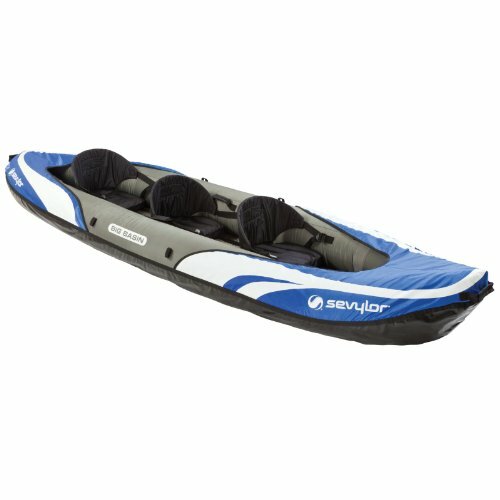 Like the other Sevylor inflatables, the Big Basin comes with multiple air chambers to inflate individually and help prevent the canoe from sinking in the instance you do get a puncture, you will be able to stay afloat and paddle to shore. The Airtight system that comes with the canoe is also almost 100% guaranteed to prevent leaks. The canoe has Boston valves installed that allow for very easy and quick inflation and deflation. The seats are also adjustable so you can easily change them to suit your needs. Spray covers are also installed to ensure you stay dry. This canoe comes with a 1 year warranty, as well as a carry bag and a pressure gauge. The carry bag makes it incredibly easy to transport this canoe, whether you carry it, put it in your boot, or just store it for the next summer, making it super easy to go on a spontaneous paddle mission. When purchasing an inflatable kayak, there are a few things to take into consideration, especially if you are only just getting into kayaking or you don’t have any experience with them. This is a list of the 4 things to look out for when buying your first, or next inflatable kayak. Like most things, your level of skill will determine which kayak you should buy. This is particularly important for beginners as experts or long term kayakers already have an idea of what they need out of a kayak and therefore know exactly what to buy. 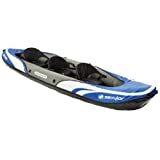 Purchasing a very simple, inexpensive kayak is definitely the way to go as, if you get more into the sport, you will want to spend your money on a more advanced model, not your first one. Purchase a kayak that is a bit smaller, which makes it easier to control, and take it out on a gentle lake to get the hang of things. Don’t get caught up in brand names, rather go for something simple and cheap, and learn before spending more. Comfort is important if you are going to be spending extended periods of time out on the water. Hunters and fisherman would prefer a kayak that has high back rests and seats you can easily adjust. Blow up seats are also very comfortable and once again, can be adjusted to your needs. You don’t want to get a sore back after 15 minutes of paddling, so when you purchase your kayak, the first thing to do is test the seats, no point in getting a great kayak if the worst part of it is sitting in it. Durability is vitally important when it comes to inflatable kayaks. You don’t want to buy an inflatable just for it to burst from the slightest graze on a log or the river bed. Look for a kayak that has a strong outer shell, preferably reinforced with ribbing or treated with some sort of coating. Many kayaks are treated with UV or saltwater coatings so that they don’t degrade over time if you are using it on a regular basis. Reinforced or padded flooring is also something to take note of, since you never know how deep a river or lake may be and you would’t want to get a puncture. Lastly, the price. This is almost entirely up to you and your budget. Like we mentioned above, if this is your first kayak, buy something cheaper, something you can afford to replace. You are going to be having a few spills and accidents so spending big money right off the bat is not advised. Practice first with something cheap and get the hang of kayaking. If you only plan on kayaking a few times a year or on holiday, maybe spend a bit more as it will be an investment, but if you are going to be full on and be in the water every day, cheap is the way to go. You can always upgrade when the time is right. We really hope this guide has helped you see the differences in models, brands, and versatility. Whether you’re a seasoned kayaker or a newbie, this guide is sure to help you see that kayaking is more definitely and affordable hobby to take up, or if you’re in the market for a new kayak, we are sure you have found your next one. If you looking for some accessories for your kayaking, check out our guide on the best full face snorkel masks, or check out our best beginner kayaks reviews.